Back in 2012, I made an online purchase of Nine’s Ranch Premium Jerky beef jerky. This review will focus on a 4 ounce/113 gram bag of their chipotle flavor. Nine’s Ranch Premium Jerky was located in Murrieta, California, and was distributed by Nine’s Catering. The operative word here being “was”. By all accounts, Nine’s Ranch Premium Jerky has since gone out of business, likely in 2013. The telltale signs are their phone number no longer being in service, and their web site is down. That’s too bad, I actually quite liked all six of their flavors that were ordered. Update: It would appear thatNine’s Ranch Premium Jerky is still in business. This jerky is advertised to use “London Broil” for their beef, which generally means that flank steak was used that comes from the abdominal area of a cow. To maximize tenderness, this jerky may have been cut against the grain, instead of the more popular method in jerky of cutting with the grain. For the liquid marinade we have teriyaki sauce, soy sauce, and liquid smoke, classifying this jerky as smoked. While there are many types of teriyaki sauce out there, this one is of relatively poor quality. Mainly because the dreaded, and very unhealthy sweetener high fructose corn syrup is first on the ingredient list by weight. With this being a chipotle flavor, it is not surprising that chipotle pepper was used. 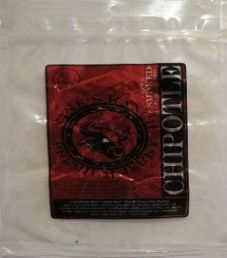 Chipotle is a ripe jalapeno pepper that is smoked and dried, with mild to medium heat intensity. It is a great source of vitamins and minerals, and also contains capsicum, which is the source of spiciness that has multiple health benefits if eaten in moderation. It is always great to see that granulated garlic and granulated onions were used, both of them being super healthy. To the credit of Nine’s Ranch Premium Jerky, there was no sodium nitrite used, nor any other similar unhealthy preservatives. Also, this jerky has no MSG added. My notes stated that this flavor was good, with a good dry texture. I do not recall this flavor being overly spicy tasting. This 4 ounce/113 gram bag of jerky cost $7.50. That would work out to $1.88 an ounce, which rates as an average price. If Nine’s Ranch Premium Jerky had not stopped making jerky, this jerky would have been recommended as worth your money. We have a fairly big, transparent, and resealable bag here. There is a label affixed to the front, and nothing on the back. Apart from being a large sized bag, it is just a plain and ordinary bag here. The Nine’s Ranch Premium Jerky logo has a cow’s head inside what looks like a wheel, the type of wagon wheel that you would see at the entrance of a ranch. There are no slogans, other than “Natural Smoke Flavor Added”, but their Facebook page, not updated since 2013 displays “The best, juiciest jerky around”. There are some bag categories missing, such as a best before date, bar code, nutrition facts table, and allergen alerts. I just bought a bag of their Sweet and Spicy jerky from the La Mesa Farmers market today, it was fantastic! I’m very happy to say they are still in business but sad I have to wait until next Fri because it’s closed now. That is a very interesting update, thanks Tana.